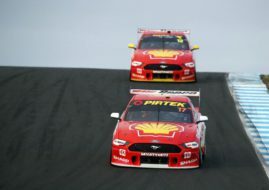 Scott McLaughlin (DJR Team Penske) wins the first race of the Watpac Townsville 400 at Townsville Street Circuit to take the lead in the 2017 Virgin Australia Supercars Championship after thirteen races. 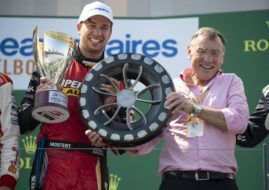 The 24-year-old New Zealander started from pole for the eighth time this season and converted the best starting position into his fifth win of the season, ahead of Red Bull Holden’s Jamie Whincup and Prodrive Ford’s Mark Winterbottom. The previous championship leader Fabian Coulthard finished in 11th place after starting ninth on the grid. 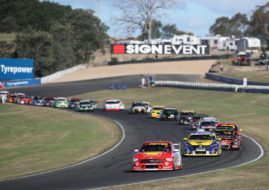 McLaughlin now holds an 18 point lead over Whincup. Coulthard dropped to third place, further 50 points behind Whincup. McLaughlin lost a lead in a dramatic start of the race but Jamie Whincup was just two laps on P1 before McLaughlin returned in front. Winterbottom progressed through the field from sixth to third off the start, ahead of Prodrive team-mates Chaz Mostert and Cameron Waters and Red Bull’s Shane van Gisbergen. At the end of the race, the top 5 positions were the same. Only Shane van Gisbergen lost one place, dropping to P7 behind Craig Lowndes. Van Gisbergen was fourth in one moment but cracked header on his engine forced him to slow down. One more race is scheduled for tomorrow.